Good news for Barcelona and the rest of Spain. The Mobile World Congress (MWC) stays in Barcelona for the next 7 years. The four day conference is the largest event in the telecom sector worldwide. The MWC has taken place in Barcelona ever since 2006. The 2012 edition was also already scheduled to take place from 27th of February until 1st of March in Barcelona. For the six years thereafter the organization investigated the possibility to move to another city. Among the competing cities were Milan, Munich and Paris. 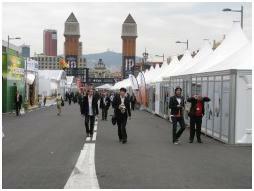 In 2011, over 60.000 people from 200 countries visited the event. At the MWC more than 1300 exhibitors announce their new products every year. The most striking examples of prior editions: the mobile operating system Windows Phone 7 and Android and the fourth generation mobile telephony (LTE). The city´s efforts to give the rest of Spain a good mobile infrastructure and the support of the government and the local business community also played an important role in the decision. The decision of the GSMA is important news for Barcelona. The earnings of the MWC are estimated at 300 million euros and thousands of part-time jobs in the first year alone. Accounted for the last seven years, the revenues total an amount of about 3.5 billion euros.